Italian exotic bike-maker Bimota have tread on the path of forced induction. Will this be the needed impetus ? Bimota, famous for delivering artwork on wheels powered by Ducati motors, had recently shown the new Impetus. As expected, the Impeto gets Ducati Testastretta 11° L-twin power, but this one is the new DVT-equipped 1,198-cc engine making 160 PS and 136 Nm. If that wasn’t enough, Bimota have developed their own supercharger kit. The in-house developed forced induction kit fits Ducati liquid-cooled motors for track-only application and bumps up output levels by somewhere between 15-20 per cent. The result is a maximum power figure around 190 PS with peak torque of almost 160 Nm. The ‘Bomita Supercharger Kit’ is available for the DB8, DB9 an DB11 as well. It doesn’t end there. 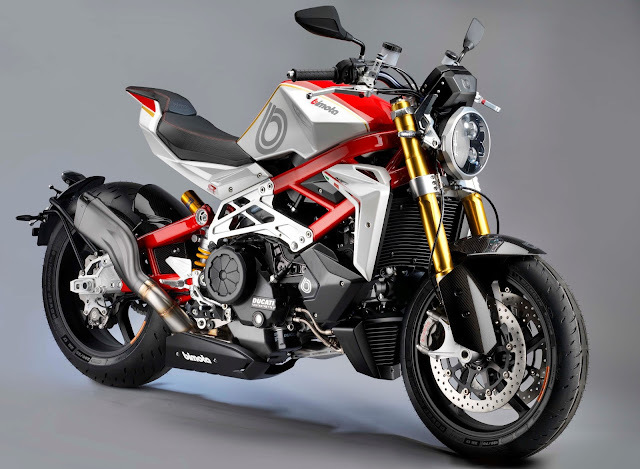 Bimota have also equipped the Impetus with ride-by-wire, multi-level traction control and ABS, plus, give you the option of having the ‘Bimota Experience Kit’ that replaces the standard alloy trellis frame with a set of carbon-fibre tubes and a carbon-fibre swing-arm. Yes, you read that right.